I bought the $5 box from Citrus Lane I told you guys about and got a GREAT deal on this box. :D You can decide if its worth the $29 regular price. I got 3 month old Peanut a box and this is what he got. 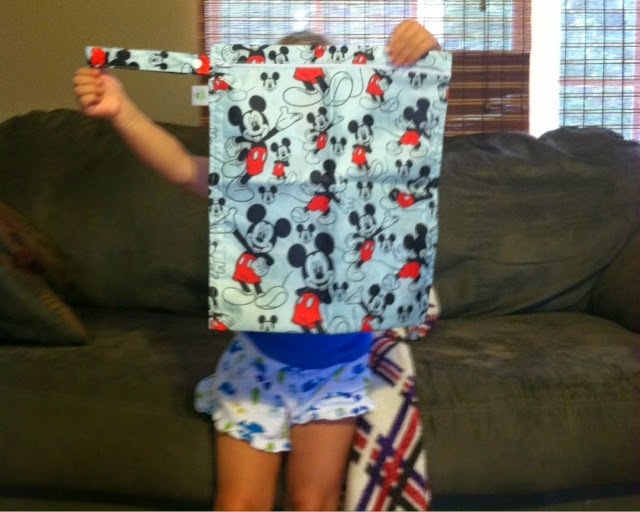 I was really excited when I saw people were getting Wet Bags from Bumkins * with Disney designs and was really hoping we would get one too. Because I was going to use the code that came inside CitrusLane14 for 35% off at bumkins.com to get one myself! But now we have one for Six Flags' new water park on Thursday! They are PVC, BPA, phthalate, vinyl and lead FREE! 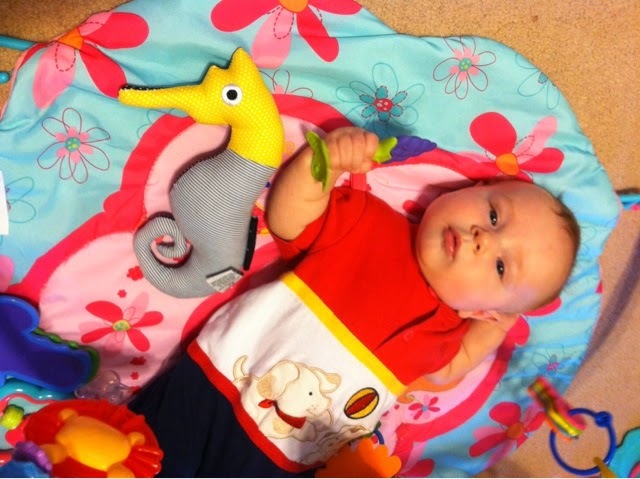 We also received a Wee Seahorse from Wee Gallery * which has a high contrast of black and white fabrics to help stimulate and engage infants and help brain development. They are machine washable as well. Use code CLS20 for 20% off at weegallery.com thru 8/31/14! The Fruit Teether from Innobaby is a brand new, award winning teether which was created to develop oral motor skills by stimulating muscles of the lips, cheeks, and tongue. We received the grape one. I was excited for this because it's easy for Peanut to grasp and he has already been showing signs of teething. They are also top shelf dishwasher safe! You can use code FRUIT15 for 15% off at innobaby.com thru 12/31/14! I have been wanting to try Burt's Bees baby products for some time now. But they are a little pricey to try out if I didn't like them. So in our Citrus Lane box we received 2 samples of Burt's Bees Baby Bee Cream To Powder *. These are actually brand new from Burt's Bees. It goes on as a cream and dries to a soft, powdery finish. Perfect for the warm summer months because it absorbs wetness while leaving baby's skin soft, dry, and smooth. Use code CITRUSLANE for 15% any Baby Bee or Mama Bee products at burtsbee.com thru 7/15/14! 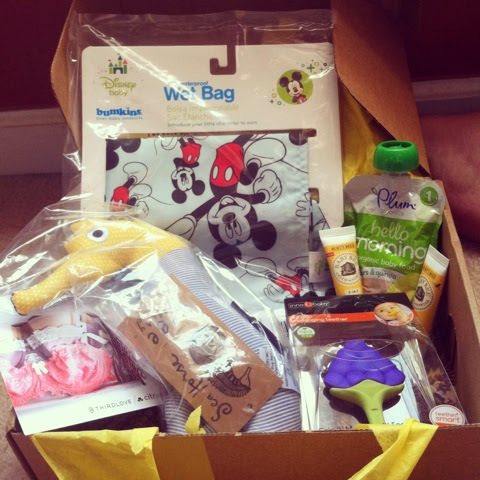 The last thing we received was the Stage 1 Hello Morning pouch from Plum Organics. I have loved Plum Organics baby food products for a while. I actually bought some today at Publix because they are the stage 2 are $1 each and I had a $0.50 off coupon that doubled to $1. I love that they have certified organic ingredients and the packaging is 100% BPA-free, but I'm not quite sure why it was in my 3 month old's box. I guess because some people choose to start solids at 4 months? But Peanut is not even close to being ready for any kind of solids yet. There's a Cherries and Oats * variety and a Pears and Quinoa * variety (which we received). You can use code HelloCL for 25% off any Stage 1 Morning pouches at shop.plumorganics.com thru 8/31/14. The mommy gift was kind of meh this time. It was a $20 off a $40 purchase at ThirdLove.com. They sell bras. I have trouble shopping for bras online because I am nursing and they all seem to fit differently. This company apparently has an app to help you with that, but I still don't know if I'll use it or not. So message me on Facebook if you think you would. I kind of wish I got SweetPea a box too since they were only $5, but she has received some in the past and I have a review (and giveaway) for Just Pretend Kids coming up where she received some very fun things too. So It evens out. She does like playing with some of the toys he received. So what do you think of Citrus Lane and the items we received? You can sign up using my affiliate link to get 50% off your first box, but you get more of a deal the more months you buy at a time! Click on the banner below and use code ESCALATE to get $20 off, so your first box is only $9 OR buy a six month subscription and get your first box for $1!